Our promo code gets you 50% off general admission to Venardos Circus! This will be a fun family event! Created by the former Ringling Bros. Ringmaster Kevin Venardos, get ready for the Venardos Circus! It's an animal-free, Broadway, musical-style show, and its custom-made big top is in Tempe at Singh Meadows near Big Surf. You see aerialists, acrobats, jugglers, contortionists, comedy, magic and more! There are several families performing in the show as well! The jugglers are mother and son, and Lyra, the aerialist is their daughter/sister. Their father is the tent master. The hand balance/contortionists are husband and wife and travel with their one-year-old. The acrobat family is also married, and they have a seven-year-old daughter who appears in one of their stunts. So, bring your entire family because we're scoring you a Deal of the Day to experience it all for half-off general admission! Adult tickets will drop from $25 to $12.50, and tickets for those 12 years and younger will drop from $15 to $7.50! They describe the freebie for babies two years old and under as: One babe in arms (2 years or younger) seated in a lap admitted FREE with paid adult ticket. This is valid for the 7 p.m. shows on Wednesday, April 17, and Thursday, April 18 only. You have until Tuesday, April 16 at 11:59 p.m. to buy the discounted tickets. You must use our promo code: "ABC15" to score half off! This is case-sensitive. It must be in all caps. When you click here, make sure you select the correct dates, either April 17 and/or April 18. Then, click the red "Buy Tickets" button. A separate window will pop up to select how many adult or child general admission tickets you need. When you click, "Next," another window will pop up asking for a coupon code. That's where you enter, "ABC15". Remember, it is case-sensitive. Make sure you write it in all caps. Finally, complete the checkout. Get there early! There is a pre-show party an hour before the show, where you can meet the cast, play games and take selfies! There will be snacks for purchase as well. There will not be any peanuts, but popcorn, cotton candy, hot dogs, lemonade and more will be available. The main event lasts about 90 minutes, with a brief intermission. 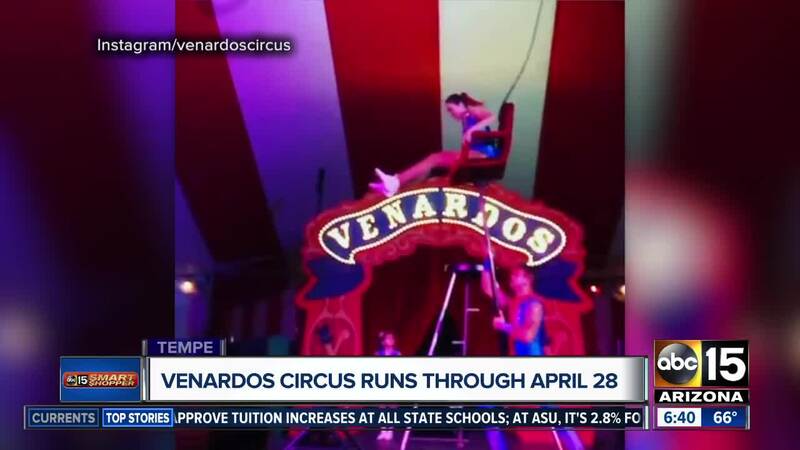 The Venardos Circus held its first performance in 2014 at the LA County Fair. Click here to learn more about the beginnings and see how it's evolved.